Golf Buddy Voice 2 golf GPS/Rangefinder stands a world apart from all competition in their category. It takes care of the little issues that were annoying about the original Voice and promises an even better interface. Overall it’s an excellent entry-level device that offers hands-free operation. We decided to take a closer look at it. The body of GolfBuddy Voice 2 golf GPS is almost square. The face is 1.76” x 1.78”. It’s only 0.49” deep. Basically, it’s more compact than Bushnell Neo Ghost and Phantom. At 1.02 ounces with the battery in, it’s barely noticeable on the visor or golf buddy voice 2 belt clip. The corners of the body are rounded. The body has a smooth finish overall. The backside has a permanently-attached clip that enables it to be attached to the hat or the belt. You also find the retractable clip or universal clip cart mount for golf buddy voice 2 available on market. Unlike most voice golf GPS, the Voice 2 has a 1” long display. But the bottom half is taken up by the power button. The screen is a monochrome LCD. It is backlit so you can easily view it in any light. It displays all the information that’s spoken out by the voice feature. There are five buttons on the body of GolfBuddy Voice 2 golf GPS. There are two buttons each on each side. Two are volume up/down buttons, one activate Voice and another measure shot distance. The buttons are built for tactile comfort. You can operate them in the blind. This Voice 2 golf GPS is available in black, white/blue and white/grey color combinations. It is splashproof so it can take some rain before you find cover. A USB charging cable and its adapter are part of the package. How do I update my GolfBuddy Voice 2? The GolfBuddy Voice 2 golf GPS can be used right out of the box if it has charge. But eventually, you might have to update the course database to get the latest course maps. For this, you must download the GolfBuddy Golf Buddy Pro Course Manager to your Windows PC. You have to register your device and create a new login if you don’t already have one. The update tool is available on the GolfBuddy website. Once updated, you can switch it on near the course, and it will automatically recognize the course from its database and arrive at the correct hole. The operation is pretty much intuitive. The GolfBuddy Voice 2 golf GPS shows/speaks distances to the front, center, and back of the greens. You can select whether you want the golf buddy voice meters to yards. In the original Voice, the screen only displayed the distance to the center. You had to toggle through the distances one by one by pressing the Menu button. Now all the distances are displayed on the screen, the distance to the center of the greens being in a larger font. The hole number and battery information are also displayed above this. Unfortunately, the Voice 2 doesn’t add hazard distances to the yardages it can tell. The Voice feature announces the distance to the greens every time you tee up. You can change the volume of Voice 2. You can even completely Mute it and solely depend on the distance readings on the screen. One upgrade from the original Voice is that you can select between a Male and a Female voice for speaking out the distances. You can select from 8 different languages and the database can be expanded to 11 languages max. In this View, you can see an approximate representation of the green based on your approach. This screen displays the par information, hole number, satellite signal and identifies the greens as left or right on holes with multiple greens. The Voice 2 golf GPS allows you to measure the shot distance with a single button press. You can note down this distance and take an average for each club over multiple shots. This gives you the club distance which helps you further in club selection. As we mentioned earlier, this GolfBuddy golf GPS automatically recognizes the courses near you when turned on. It also advances through the holes automatically. This way, with the voice feature, switched on the operation is pretty much hands-free. For the first-time buyers though, we recommend Voice2 over the original Voice, one of our best small golf GPS. The GolfBuddy Voice 2 golf GPS comes preloaded with a 35,000+ course maps worldwide. You are likely to find your local courses over here. The Voice 2 claims a battery life of 14 hours. In our tests, it lasted at least through 3 rounds. In contrast, the original Voice averaged 9 hours only when we used it. This golf GPS proved to be highly accurate and consistent in our tests. We were always 1 yard within the readings from the laser rangefinder. It has a flip-screen feature which flips the screen right side up when clipped on to the belt or the visor. 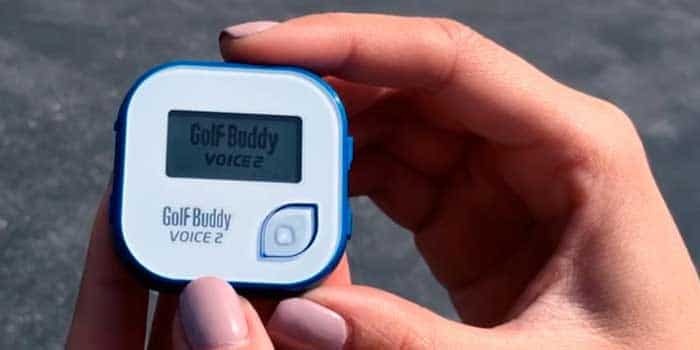 The GolfBuddy Voice 2 golf GPS addresses the biggest complaint we had with the original Voice: toggling to get front and back distances to the greens. While we appreciate the upgrade, we also wanted the hazard distances feature just as badly. While Voice2 is great value for money, it might not be worth an upgrade for the Voice-user.